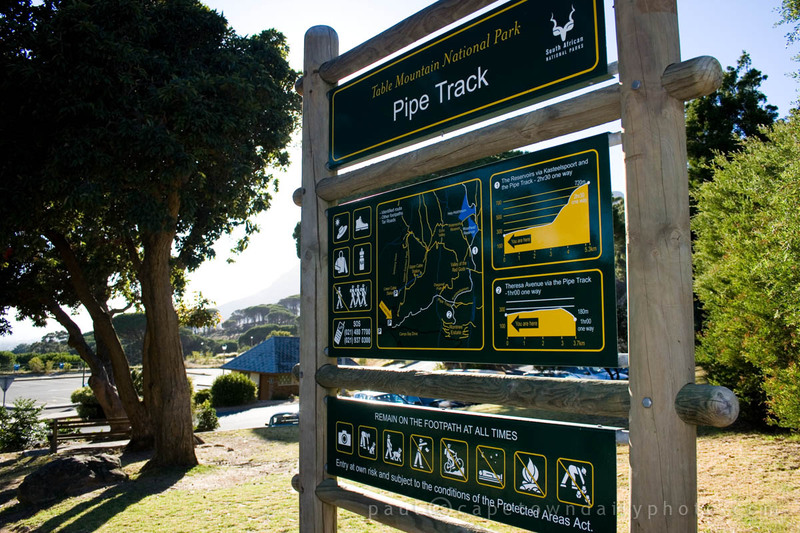 The Pipe Track is one of Cape Town's easiest hikes along the side of Table Mountain. It starts at a convenient spot with plenty of parking, just above the city centre, and follows a leisurely path along the back of the mountain, showing off the splendour of Camps Bay, the Atlantic Ocean, and the Twelve Apostles mountain range. The path is well-frequented, especially on warm and windless Saturday mornings. I think the best time to walk the route is in the early morning, just as the sun rises over the Boland mountains. Around this time of the year in particular you'll find that the air is crisp and clear, and that the wind hasn't yet had time to awaken. Take a look at this map of the Pipe Track. This route is about 3.5 kilometres long (one way) and should take you about an hour to complete. So, to be safe, set aside about three hours for this trip. The extra hour will come in handy for taking in the sublime views! Posted in Activities and tagged leisure, table mountain on Thursday, 25 February, 2010 by Paul.